Hey all! 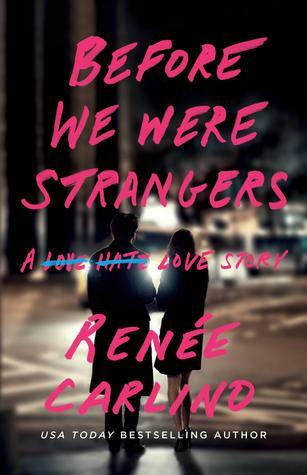 Today, I will be discussing and sharing bits and pieces to the fabulous novel that is BEFORE WE WERE STRANGERS. 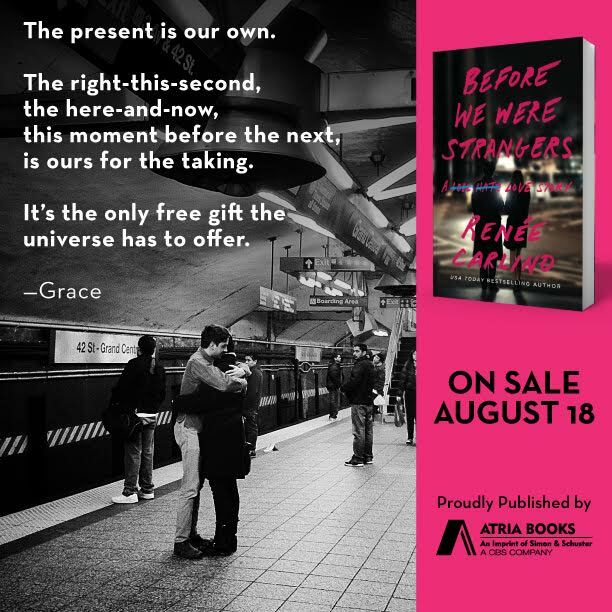 You guys, this book touched me in many different ways, and I can't wait to discuss it with you! Without further ado, let's get the party started! Thoughts: Renee Carlino is most definitely one of my absolute favorite authors. I love the witty way she writes these complex characters that are so darn easy to fall in love with. Proof comes from characters from her previous novels, and that includes Matt and Grace. These beautiful people had me laughing, cringing, cheering, loving, and crying for them on multiple occasions. By the end of the book, all I wanted for the both of them is a slice of happiness. Let's go into depth, shall we? The novel starts off in the present. Matt is in his thirties, living in New York, and wondering what happened to his life. He has his dream job, a prize winning photographer and all the things he always wanted, but that doesn't mean he's happy. It's not until a flash from the past reappears that he starts questioning what happened his senior year at NYU. It's then that the novel jumps back to Matt and Grace's first day senior year at NYC. This is also when the novel starts rotating between Matt and Grace's point of views. One of the things I loved about the novel is the relationship building between the two. It started off sweet- Grace helping Matt move his ginormous desk into his dorm at Senior House. I adored watching their friendship grow and how lighthearted and easy everything was. Though things started off great between them, issues with finances and their families slowly started getting in the way. I'm not going to lie, I began twirling my thumb a bit towards the middle. You knew they both had deeper feelings for each other, and it's clear there's chemistry and attraction between the two, but Grace kept pulling back. I think part of her didn't think she was good enough for Matt, even though she said she wanted to focus on her music career. Even their friends thought they were an item when they weren't! I guess that's college for you! Anyway, whenever they finally did get together, it was fabulous! Steamy yet slightly awkward, and I loved how Grace asked Matt questions about how he knew "what to do". More awkwardness, but it's totally something I would've done (insert winky face here). Oh, and I just have to talk about the hilarity in Matt's character. There's a scene involving jump ropes that had me grinning from ear to ear. Now, you know from the first movement that things clearly take a wrong turn somewhere. I'm not going to go into details, but I will say that it was very hard for me to read. My heart ached for the both of them, and all I wanted to do was yell and scream why. WHY?! In the third movement, you get to see Matt and Grace again, older and wiser. Grace is more standoffish than she used to be. The lightness of their youth is gone. Secrets are slowly revealed, and not once do you truly know how things are going to end. Just the ash. This, my friends, is one of the many reasons why I love Renee Carlino's writing. She's just so good at building these realistic, compassionate characters, and all you want to do is go to NYC and possible have a cup of coffee with them. Carlino is amazing at writing raw, pure, fabulous emotions any of us can relate to. 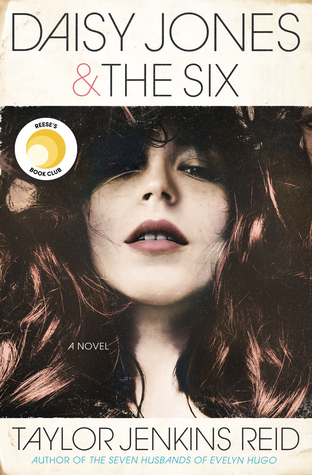 Overall, I highly recommend this novel to fans of Samantha Young, Jill Shalvis, and all of the other amazing contemporary writers out there. It'll have you reminiscing over those unforgettable youthful college days with the highs, the lows, and everything in-between. It's a fabulous journey, one you don't want to miss. 20. You Remembered . . . The present is our own. The right-this-second, the here-and- now, this moment before the next, is ours for the taking. It’s the only free gift the universe has to offer. The past doesn’t belong to us anymore, and the future is just a fantasy, never guaranteed. But the present is ours to own. The only way we can realize that fantasy is if we embrace the now. I had been closed off for a long time, and I hadn’t allowed myself to imagine the future because I was still stuck in the past. Though it was impossible, I had tried to re-create what Matt and I once had. I wanted nothing else; he was all I could imagine. But Orvin once told me that time is the currency of life. And I had lost so much of it. It was that idea of lost time that finally made me realize I needed to move on, that I would never have what I once had with Matt. I had to mourn our relationship and move on. Two months ago I was walking around in a thick fog of regret. I was going through the motions but wasn’t feeling anything. I’d stare at my new wrinkles in the mirror and wonder where they came from. I wasted more time, repeating the same thing day in and day out, barely present in my own life. I wasn’t looking to break out of the cycle in search of anything meaningful. Until I saw Matt in the subway station. Everything changed. I could see in color again, every image vivid and crisp. Over the last fifteen years, the pain of what had happened to us waxed and waned. Many times I tried to force myself to stop thinking about him, but there were too many reminders. I thought, if I ever saw him again, he’d look right through me, like I was a ghost from his past. That’s how he made me feel that summer after college: someone who no longer existed. But when I saw him in the station, his eyes locked on mine. He recognized me instantly, and all I could see in his face was pure wonder. It was like he was seeing the sunset over the ocean for the first time. As my train disappeared into the tunnel, his expression turned to desperation, and that’s when I knew there was a missing piece to our story. What was behind his desperation? What had happened to him in the last fifteen years that would send him running down the platform, his hand outstretched, his eyes full of longing? I needed to find the answer. I had an idea of where I could find Matt, but I was too scared to look. Also, be sure to check out Matt's Missed Connection Ad. It's too cute to miss. Hi Buddy, I liked your insightful website. I Only Wanted to share you something about simcity buildit free cash which is my preferred game and I love to perform simcity buildit simcash with simcity buildit review and I Only Wanted to understand you that you can now use simcity buildit guide in the game because it actually is amazing to use simcity buildit trick which Let you do anything in simcity buildit tricks as per your requirement. I Anticipate you comprehend what I am talking about about simcity buildit tips when you perform with it with simcity buildit guide and you may additionally like simcity buildit, and if you Appreciate simcity buildit game please share it with your friends. thanks. Hi, I liked you blog and wanted to give you some thing about madden mobile for obtaining all madden mobile tips assets in the games ligally mobile, madden mobile guide can be utilized, I wanted to use madden mobile in my own gaming also and am looking for the madden mobile review. if you locate madden mobile tips somewhere pls discuss madden mobile 17 with me. even though, your information was extremely great thanks. and pls dont forget about madden mobile 17 guide yo. thanks again. The blog is extremely useful to keep I can share the ideas of the future as this is really what I was looking for, I am very comfortable and pleased to come her.